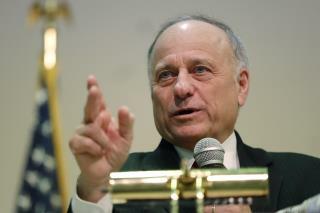 (Newser) – Rack up another racially tinged remark for Steve King. The Iowa representative Thursday compared Iowa flood victims to Hurricane Katrina victims in New Orleans in 2005—and the Iowans come out a little better in his eyes, CNN reports. "Here's what FEMA tells me. We go to a place like New Orleans, and everybody's looking around saying, 'Who's going to help me? Who's going to help me?'" he said at a town hall in Charter Oak, Iowa (see Facebook video here). "We go to a place like Iowa, and we go, we go see, knock on the door at, say, I'll make up a name, John's place, and say, 'John, you got water in your basement, we can write you a check, we can help you.'" WWOW! What a great location for a moon roof! Grassley was in line with his hand out for his share of the farm welfare fund. I wonder what King had to say about that?